K started reading Young Scientists magazines last year and got very interested with the information she read. I didn’t think much about it for a good while as I thought that it’s ok to read comic so long as she IS reading. After a while, my hubby and me realized that her general knowledge improved greatly and she would share her findings with us through casual every-day things. Seeing her interests grow, I started loading up on every past issue I come across. Within few months, this is the outcome – book shop. 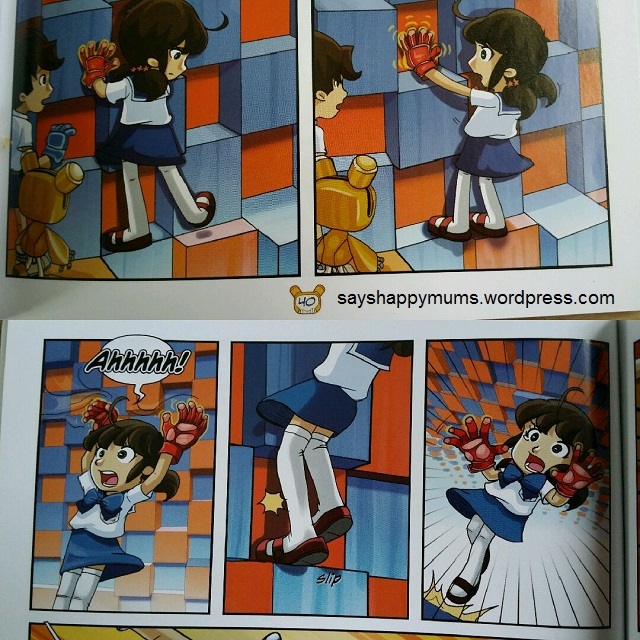 Some half year ago, I got to know of this new science comic series available in Singapore. Being a strong advocate of fun learning with my kids, this information stuck on to me like how a crab would pinch me and never let go. 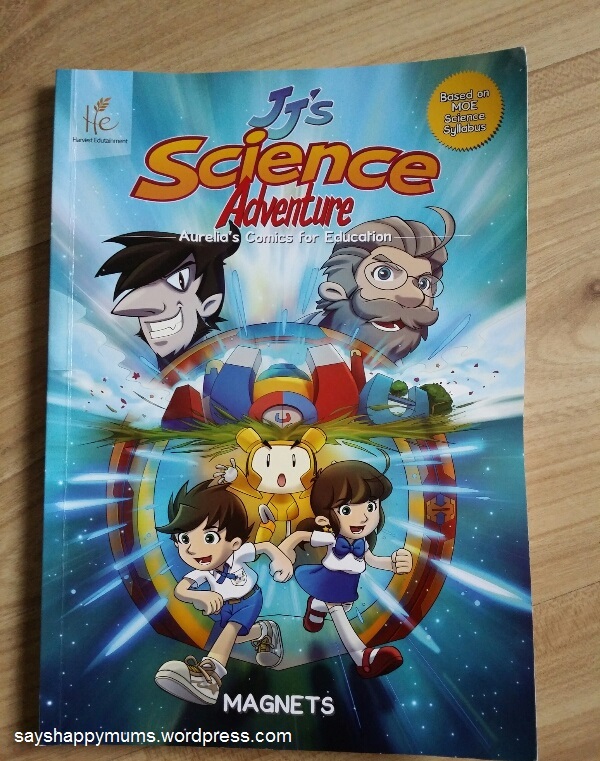 Although there were a handful of reviews done for JJ’s Science Adventures, I wasn’t totally sure that this “high level” book is a MUST-GET given that K was just 7 yo and the book is pretty costly at S$18.90 each. Later on I got to know of this Science Workshop event organized by a RC at Bt Batok. 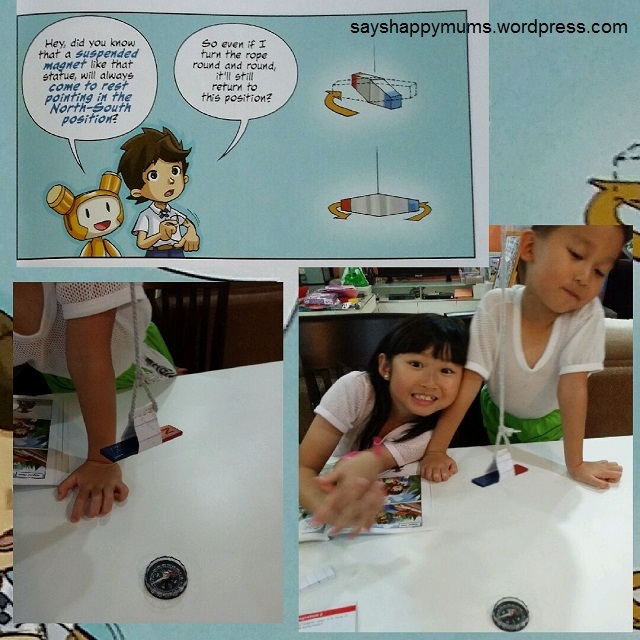 The author of JJ’s Science Adventures, Aurelia Tan, worked with the RC to include a copy of “Magnets” in the goodie bag for all kids who signed up for this event. The cheapo me worked out that this is an excellent time to get the book AND the kids can get to have some fun at the same time, all at a cost of only S$15/child. Although ultimately I didn’t get to attend the event due to calendar mix-up, I was very glad that my friends helped me to secure my copies. When I finally received the book, I knew this is it. I would be chasing after every copy henceforth. WHY? The drawing style of Nicholas Liem (the Illustrator) appealed to children. Characters and motion effects are drawn in manga style. The eyes are big & round. The robots are cute. There’s a lot of big action visuals that attract the reader’s attention. It generates interests and motivates children to read on. The text (and it’s font size) has good spacing and is easy to read. Key points are highlighted in bold and blue. It stands out! I later on found out that these key sentences are WHAT SCIENCE TEACHERS LOOK FOR and are worded such that they can be used in the test papers (typically Science Paper II). Each key point also has a plot around it. 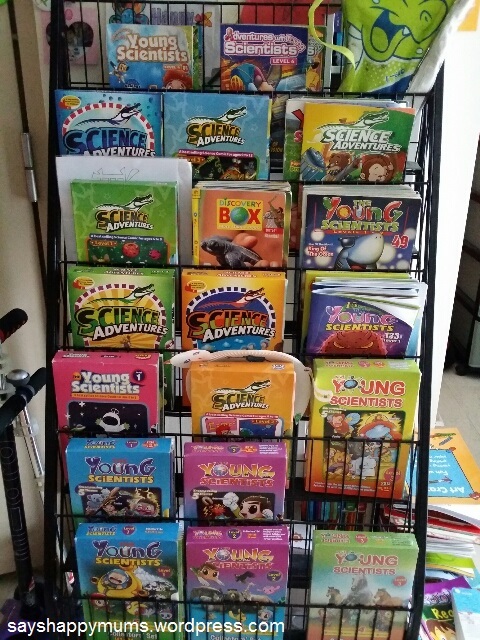 The Young Scientists (YS Mag) and Science Adventures (SA Mag) typically found in Popular bookstores and via school subscription are filled with many different topics in a book and each bite-sized info is presented in it’s own graphics consisting of 3-4 pages. There is no link from cover to cover. Its like a compilation of general knowledge here and there. I’m not saying that YS and SA Mags are no good. They are excellent as well. But to compare JJ’s Science Adventures books to YS/SA Mags is like comparing apple to orange. 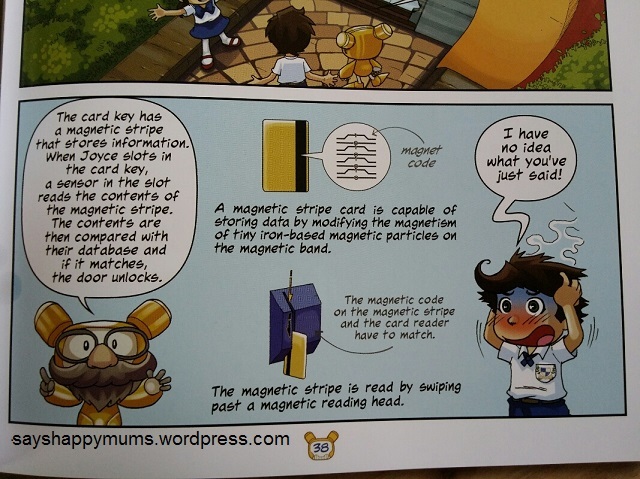 Unlike YS/SA mags, JJ’s Science Adventures explores only one single topic per book (in this case, everything a kid needs to know about Magnets at primary level). The concept of Magnets is weaved and strung into a fast-paced adventure story from start to end. This format appeals to visual learners on a otherwise very dry format found in textbooks. JJ’s Science Adventures revolves around Joyce and Jonathon and their adventures. Joyce is a sweet little girl who loves all things pretty (sounds like your girl??). She is also afraid of the unknown and anything repulsive. Joyce is highly intelligent and resourceful. Jonathon is Joyce’s twin brother who takes care of Joyce very well. Although he is very witty, moments of being blur and silly made my kids laugh at his doing. Professor Tan is JJ’s grandfather. He is also an Inventor and has made the kids a sling-bag ‘World Maker’ which is a machine that can create worlds in a different dimension. Grandfather also created a highly intelligent robot which can think on it’s own, called Rob-O. As with every story, the plot must include a no-good-bad-bad character, ie Mr Sinister and his minion naughty robots. He had helped Prof Tan to construct the ‘World Maker’. Because of his selfish desire to be recognized for its invention and getting rich over it, he carried out some wicked plans in trying to achieve it. With familiar characteristic behavior of JJ akin to our own children and a well-illustrated story line, the book is able to attract young readers and at the same time RE-PRESENT to them what they need to know . JJ’s Science Adventure has claimed The Readers’ Favorite Illustration Award in Miami, Florida last year. They will be going for more this year. All the best, Aurelia & Nicholas! Through various channels, Aurelia took comments and feedback from 200 children in order to produce the final version of JJ’s Science Adventures. Base on what these children like/dislike, a total redesign of layout & characters definition took place. The entire production of “Magnets” took 1.5 years to complete. Aurelia as an experienced Educator, she not only try to teach. She tried to impart knowledge in a fun way and make sure the info is retained. It is indeed a notable effort to make this book a success. 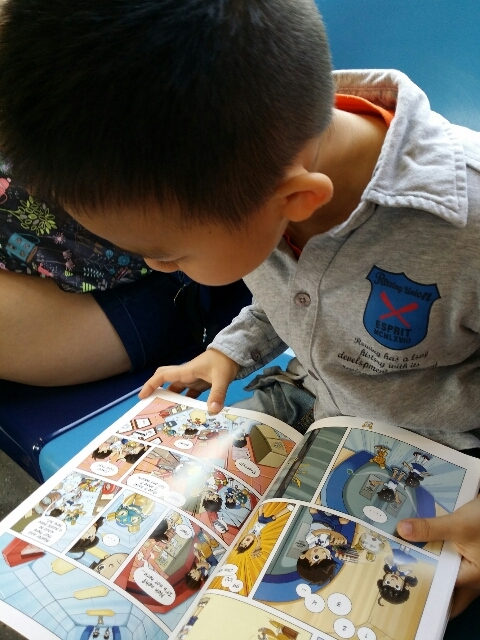 Back to home ground, I made sure that K has read the story well by asking her questions while I pretended to be the blur mummy (oh by the way, K thinks that her teacher is smarter than mummy……..That’s the difference between pushing knowledge and pulling knowledge when teaching kids. Wherever possible, I try to fish conclusion out of them, rather than feed them a conclusion). As for R, I have to read out loud to him as he is a lazy reader who is solely into graphics only. Through reading to him and questioning his understanding as the story unfolds, I realized that he did not understand the story especially the part where Joyce fell off from the red wall tile while she was wearing red gloves (he thought the tile was sticking to her gloves but didn’t understand why she fell instead). He needed manipulatives. K has this Science Kit full of magnets and related accessories since 6yo. The kids have been playing with magnets since they were toddlers. But it’s just simple works between like-poles and unlike-poles and I never explored further with them then. 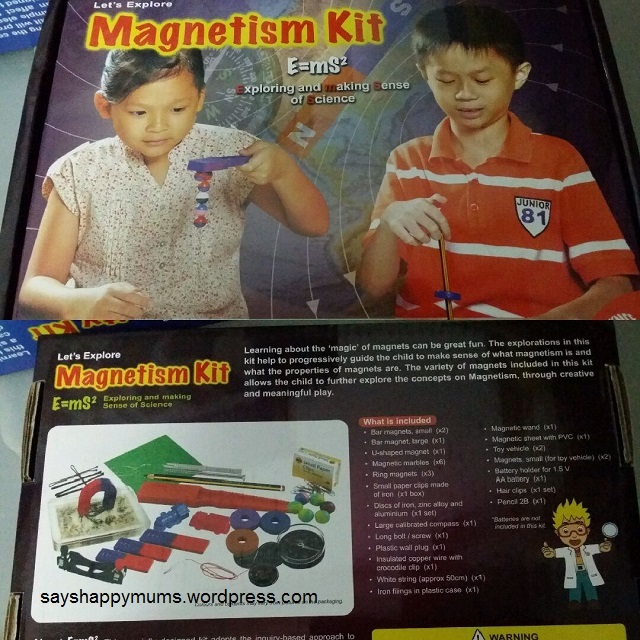 This kit has everything to complement JJ’s Science Adventures “Magnets”. I got this kit from the Science Centre. It is marketed for 6-10 yo. Mummies keen to get it can buy from their retail outlet at Science Centre. 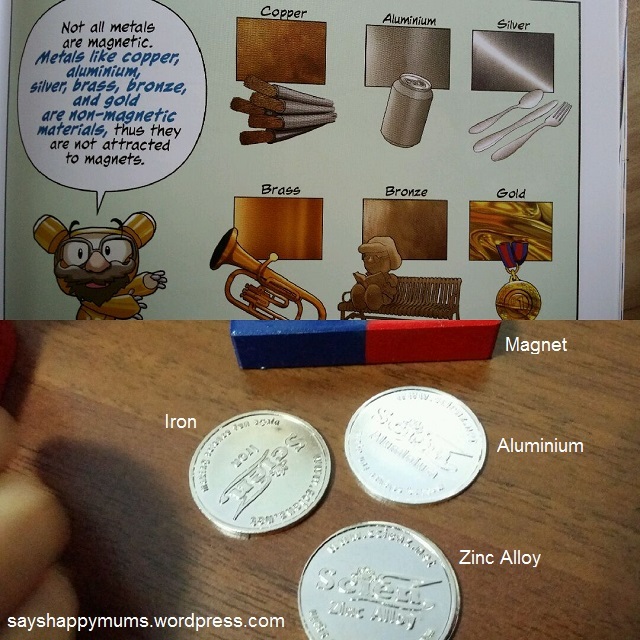 To help R and also reinforce K’s reading, I fished out the above kit for them and guided them first to the pages illustrating the basic concept of magnets. We had a little fun just before bedtime (“hitting while the iron is hot”). Experiment showing that magnets will always be aligned with N-S direction. The compass is needed to prove that. Not all metals are attracted to magnets. These 3 metal coins illustrated the concept. 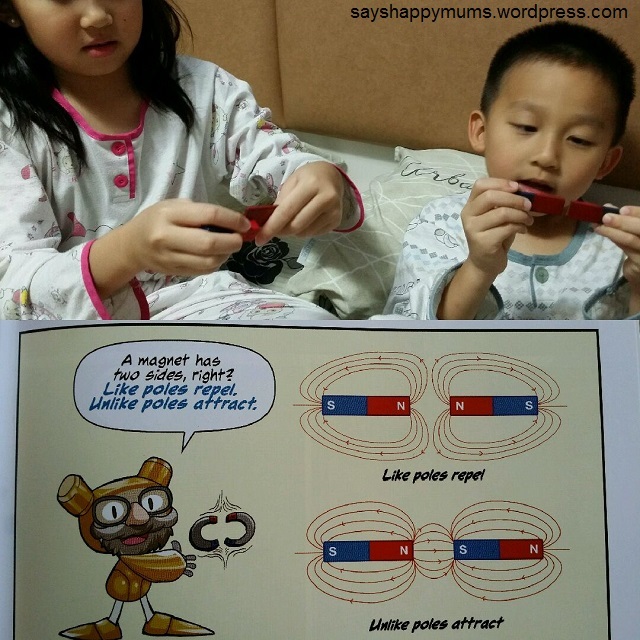 We explored electromagnetism as mentioned in JJ’s Science Adventures too. Though I have more battery kit and alligator clips from another separate science set dealing with electricity, I didn’t fish them out as I’m quite worried of the copper cable getting too hot for handling. Kids having a go at making their own temporary magnet. And we also learnt that the higher the number of times the hairclip is stroked by a magnet, the stronger it is as a temporary magnet. This is something we all know, but I did not relate this to practical magnetic uses in our daily life. Am glad that the book highlighted it. With the above few simple experiments we have done, I closed the topic of magnets for the time being. When K reaches P3 Science (which is next year), I am very sure that this topic would be easy peasy for her to pick it up again. Aurelia used to be a MOE teacher and is now a home tutor with a 2nd degree in Psychology (1st Class Hon.). She left for Australia to study Educational Psychology and is on her way to gaining practical experience with clinical studies right now. As an Educator, she has done alot, alot more than what she needed to do for her kids. When I first got to know her, I mistook that her P1 kid is her child but later found out that it’s actually her student that she’s referring to. Hearing about her story and seeing some pictures of her kids, I too wish that my kids can meet a teacher like Aurelia in their life. I have had wonderful teachers in my life too. But Aurelia is awesome like no other. She’s like a guardian angel to her kids. Since when is it the tutor’s job to go shopping for badminton shoes with her sec school kid so that her feet will be protected during play? She has tutored the girl since P1 to 20 yo and calls her her “Princess”. Since when is it the tutor’s job to nag/fuss over her kid’s move to study in Australia and make sure she settles down and keep her pants up? When I see her student’s Instagram photo, it says #bestteacherever. She also took the naughtiest teenager in class to the Church and held his hand to embrace education in life. The naughty boy is now a 35-year old fine young man. Another Prince is now a handsome Commando. Aurelia is a down to earth person who loves her mum dearly. She loves walking (but not shopping) and embraces life. It seems fated that I got to know Aurelia and we clicked like old friends. We chatted so much these days it feels like we haven’t met for 20 years. I think our friendship will go a long way too. If you are keen to know more about JJ’s Science Adventures, you can visit Harvest Edutainment, Reader’s Favorite or goodreads for some reviews. A 2nd review on “Heat & Light” will be published as soon as I am finished with the kids. #Disclaimer : This is NOT a sponsored post. I purchased a copy of “Magnets” as mentioned in this post. All opinions are our own and we feel that Aurelia’s book totally deserves more awareness. 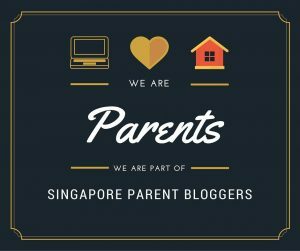 Do support local authors!